A More Dynamic Divi is on the Way! Few features have been requested more than dynamic content and we’re excited to share that development on this important feature has begun. Divi has been popular from the very beginning because of the power it places in the hands of every user, regardless of technical ability. 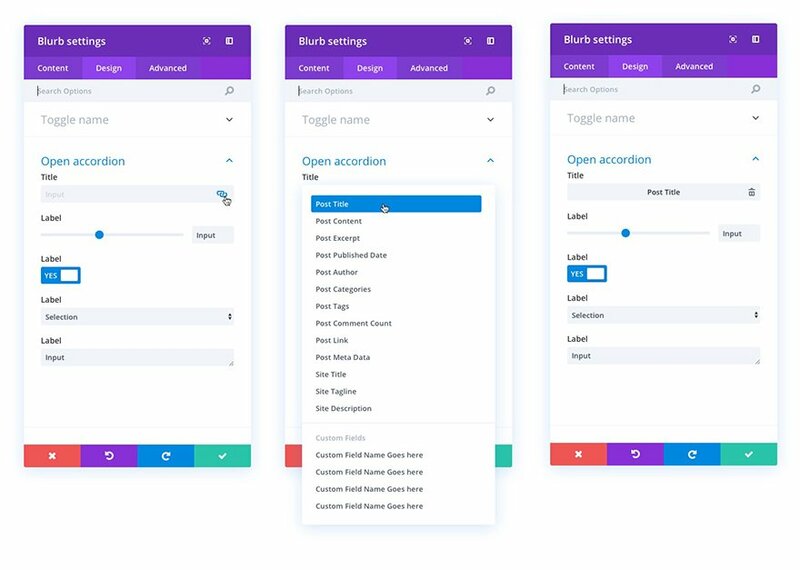 As Divi has matured we’ve added features that allow you to fine-tune just about every element of your website, in real-time, right before your eyes. No coding required. For many of us, it has forever changed the way we design websites. Similarly, we think this update will forever change the scope and complexity Divi users are able to achieve with their WordPress websites without the need for complex development. Simply put, Dynamic Content inside Divi will place a whole new set of web design superpowers into the hands of each and every Divi user. Believe it or not, but dynamic content is not completely new to Divi. In fact, you may already be familiar with it, even if the term itself is new. The best current example of dynamic content within Divi are modules like the Fullwidth Post Title Module. This module pulls in content from your post’s metadata, featured image, and post title field to create a more customizable post header/title. It’s that action of pulling in content from somewhere else that makes the module dynamic. When you save that module and add it to another post, the design settings will stay the same while the content it displays will change dynamically based on the new post’s content. In our upcoming dynamic content feature release we’ll be expanding on this type of functionality and adding it to a lot of exciting and useful places throughout Divi. With the dynamic content feature release every text and image input in every Divi module will be able to display dynamic content. Having dynamic content so thoroughly integrated into Divi will open the doors for a staggering amount of creativity. We can’t wait to see all of the unique ways you will find to take full advantage of the new dynamic content options we’re building in. Just in case the impact of this update hasn’t quite sunk in yet, let’s take a moment to tease some of the things you’ll be able to do with Divi’s new dynamic content functionality. The first and most obvious use case for this feature release will be creating custom page and post “templates” (which will actually be layouts with dynamic elements saved to your Divi Library) that you can reuse over and over again without updating or changing any of the template’s text and image elements manually. Want an author image/bio at the top of a post instead of the bottom? No problem. Want to design a cool and creative way to display comment counts? No problem. Want to create novel title/feature image displays that were previously impossible? No problem. But perhaps the most interesting and exciting use case for Divi’s new dynamic content will be all the ways you’ll be able to use custom fields. With this new release you’ll be able to take any custom field that you’ve created or that third party plugins provide and pull that content into a layout that you have near total design control over. This should result in a stunning array of dynamic content templates that simply wasn’t possible before. And I for one, can’t wait to see what we and you create. As if everything we’ve already discussed isn’t enough, this impending feature release will be just the beginning of dynamic content inside of Divi. This update will lay the groundwork for some of our most requested Divi features of all time. Namely, the ability to use the Divi Builder to create and edit headers, footers, custom post types, category pages and more. Check back next week for more details in our next sneak peek! The post Divi Feature Sneak Peek: Dynamic Content appeared first on Elegant Themes Blog.